JP Dellacamera (right) will broadcast his ninth men’s World Cup and 14th overall this summer, when he travels to Russia for Fox Sports. He is pictured here working at a U.S. women’s national team game alongside Cat Whitehill (center) and the late Tony DiCicco. For the first time in 12 years, JP Dellacamera will have a television play-by-play role at a men's World Cup. 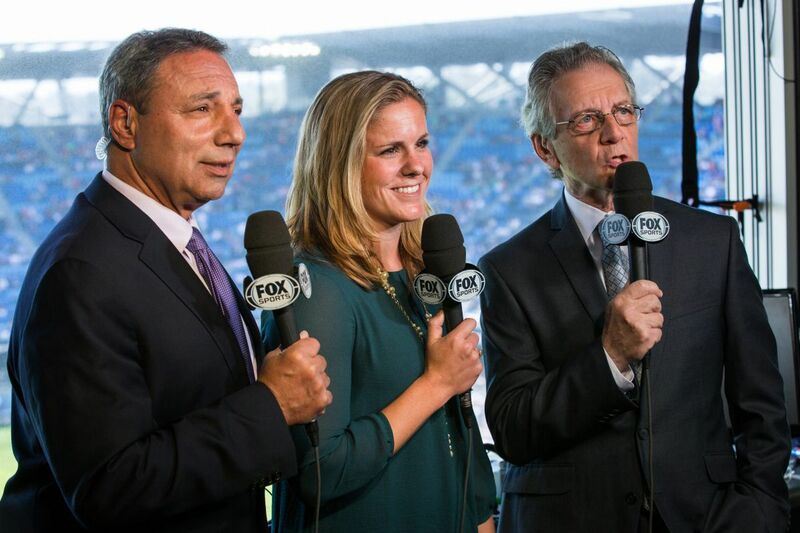 The veteran Philadelphia Union and Fox Sports broadcaster will be one of six Fox play-by-play voices for this summer's World Cup – and one of just two who will work on-site in Russia. It will be Dellacamera’s ninth men’s World Cup. His last TV role in the tournament came in 2006 with ABC and ESPN. The Massachusetts native called play-by-play on TV in 1986, 1990, 1998, 2002 and 2006; and was on the radio in in 1994, 2010 and 2014. There have been other high-profile assignments since 2006, like the 2008 Olympics for NBC and the 2015 Women’s World Cup for Fox. But even with the latter's history-making viewership, a television role at a men's World Cup brings the brightest spotlight the sport can offer. And Dellacamera is finally back in it. "I always look at these assignments as an honor and a privilege," he said. "I never assume that I'm going. Just because I did eight doesn't mean I'm going to do nine. When I did four, that didn't mean that I was going to do a fifth one. So I always treat these with the utmost respect. I think that you work hard to try to get yourself in the discussion to go to these World Cups, and you work even harder once you're there to prove that this is where you should have been." Dellacamera, who moved from ESPN to Fox in 2011, doesn't have to sell himself to anyone who knows his track record and work ethic. Fox Sports World Cup executive producer David Neal is one such person. He assigned Dellacamera to this summer's opening game: host Russia vs. Saudia Arabia in Moscow on June 14. "JP, being the preeminent voice that he has been for so many years in American soccer, having him do the opener makes perfect sense," Neal said. Dellacamera's broadcast partner will be former national team goalkeeper Tony Meola. The northern New Jersey native has become a broadcasting stalwart and worked with Dellacamera before. They first met nearly 30 years ago. "When he was a young goalkeeper, I was broadcasting his games – including one of the biggest games in his life, in 1989 in Trinidad," Dellacamera said, referring to the game that qualified the U.S. for the 1990 World Cup. "Now it's full circle." Dellacamera and Meola will be in Russia, and know their game schedule through the group stage. They get another big contest on June 17 when Mexico faces defending champion Germany. Later on, they'll have games involving France, Belgium, Brazil and Argentina. That means Dellacamera will likely get to watch Lionel Messi, one of the game's greatest all-time players. Dellacamera has called many games involving Messi over the years and considers it a privilege. "If you wanted to compare him with other sports, it would be like a network announcer calling a Michael Jordan game years ago, or a LeBron James game now," he said. "To watch somebody like that in person, knowing that every touch he brings people – fans and broadcasters – out of their seats, it's hard to describe. Whether it's a free kick or during the run of play, you always know when he's out on the field that there could be a moment of brilliance, and you get to call it." What will life be like in Russia? Dellacamera said he has "full confidence" that the host nation "wants to put on the best show that they possibly can." Like many, he's aware of and understands Russia's role in the global political climate. He also knows he is in a fortunate position, as Fox's staff will make sure he and his colleagues are looked after properly. "As much as there could be challenges in Russia, I do think it will go very smoothly," Dellacamera said. "They know what to expect there, in terms of everything from the travel to the food, what you should do, what you should not do. Whenever you travel to any country, whether it's Russia or anywhere else – even if you travel in the United States, people will be told to do certain things or not do certain things. We've had briefings [and] I have full confidence in Fox's security and in their staff." Dellacamera leaves for Russia on June 7. His last Union game before departing will be June 2 at Atlanta. While he's gone, the Union will follow the same plan they've always had when Dellacamera is away: Dave Leno will handle play-by-play, alongside usual analyst Tommy Smyth. In the course of talking with JP, he told me a long story about his first time broadcasting a World Cup, back in 1986. I couldn’t fit it in my piece, so I offer it here.